On Bradstreet: Can I get some cheese with that? Can I get some cheese with that? So today, Friday, on my day off, I wanted to Put Some Food By. 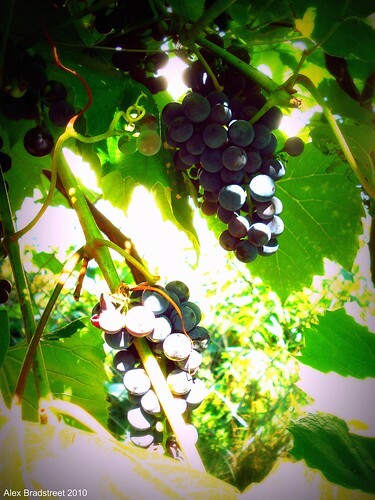 We had a great harvest of grapes this year, (15 pounds, yeah baby!) 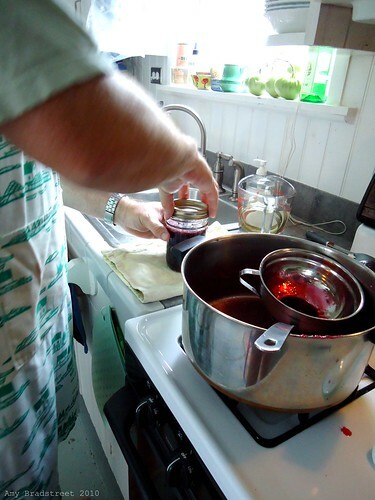 and I had cooked down the juice to be able to make grape jelly. 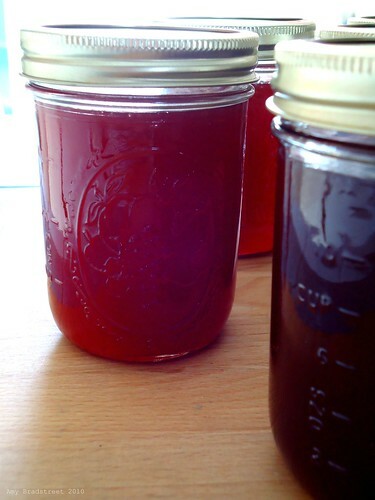 In addition, my parents had dropped off a big bag of crabapples, so I would also be making crabapple jelly. 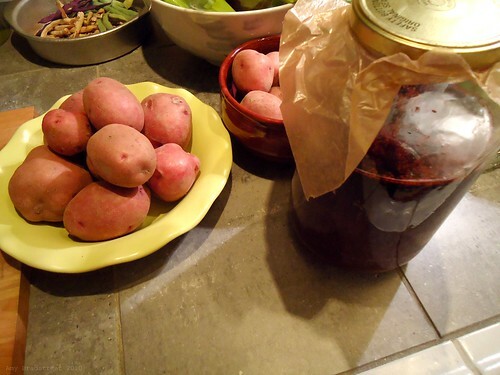 I also wanted to try making wine, so with some of the grape juice and with some of the mountains of blackberries we had in the freezer, I would have enough for a 1.5 gallon batch of grape wine and a 5 gallon batch of blackberry wine (to share of course!!). I'm not a winemaking expert, and I don't play one on TV. I have had some good luck with beer and mead, and some bad luck with cider and a cyser (that became stuck and then became a braggot and ended as a weird highly alcoholic mess)...enough about that. 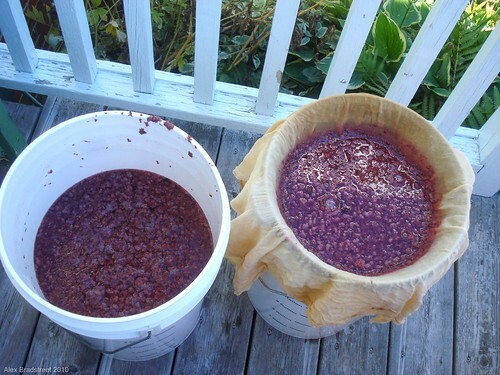 My parents have been making wine for years, so I just feel like it is something I should figure out how to do. 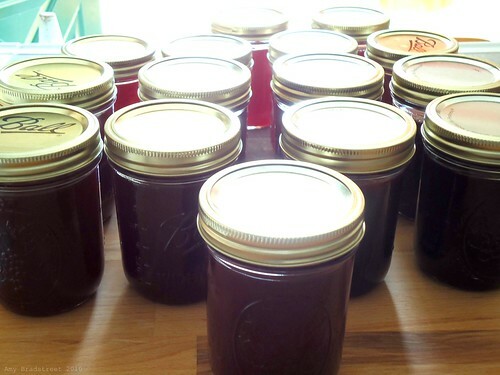 After making the grape jelly and crabapple jelly, I got the grape juice and the blackberries ready. 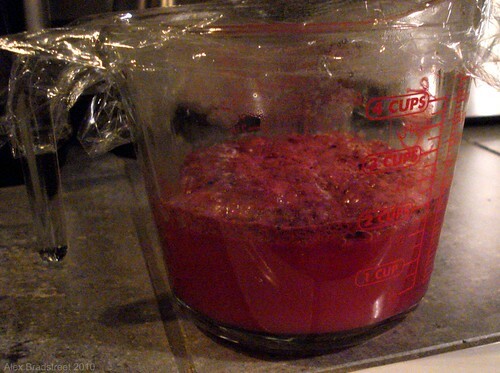 Added some tannins and pectic enzyme to the grape juice, and it is done until 6 pm Saturday. 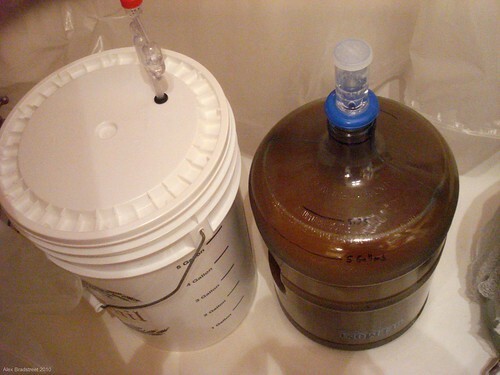 tomorrow I will need to find a suitable primary fermenter for the 1.5 gallon batch, check the acidity and sugar level and adjust as needed, and then pitch either the yeast or the starter. 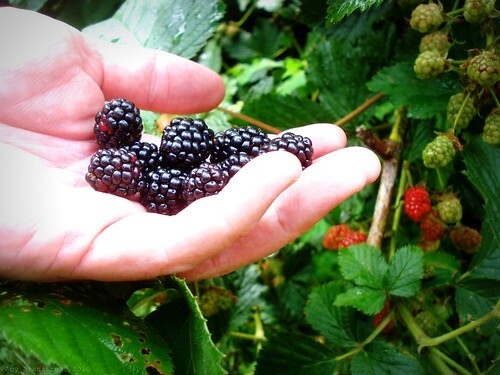 For the blackberries, I needed to get the 12 lbs of fruit thawed, and with our weather that was easy. Then into the big bucket to get a bath with 4 liters of boiling water (our electric kettle is metric - sorry) to kill any bacteria or fungi hiding among the fruit. Once it cooled a bit I added the pectic enzyme and now I have to wait 24 hours until the real fun begins. I'll need to sweeten the must and add water as well as the yeast. Did I mention I was also starting a batch of beer? I had a kit that I had ordered, but never used. I've had to replace the yeast with some Danstar Nottingham ale yeast, so I'm not sure how it will turn out, but it looks and smells like an ale, so we'll go with that. The outdoor blast furnace cooker that I purchased has got to be the best $25 I've ever spent. 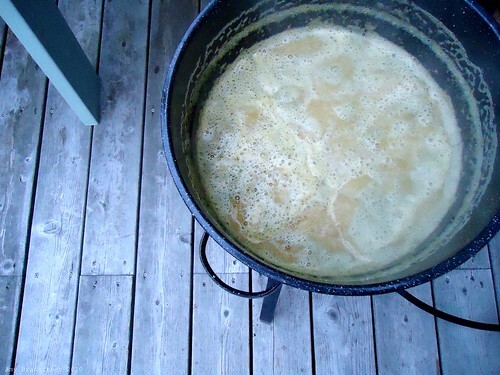 Not only is it great for canning, lobsters and scaring the neighbors, but it got my wort boiling in just a few minutes. With a slight twist of the valve, I had a beautiful rolling boil instead of a scary boil over. That Saaz hops looked right at home. 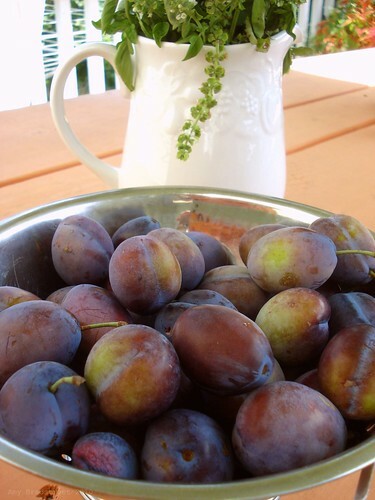 Before finishing the wines, I also made a batch of plum jam, using our Goodwill purchased, new-in-the-box food mill. 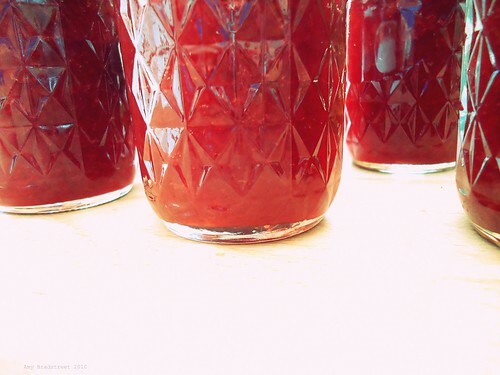 It made six cups of jam, plus a little left over for sampling. 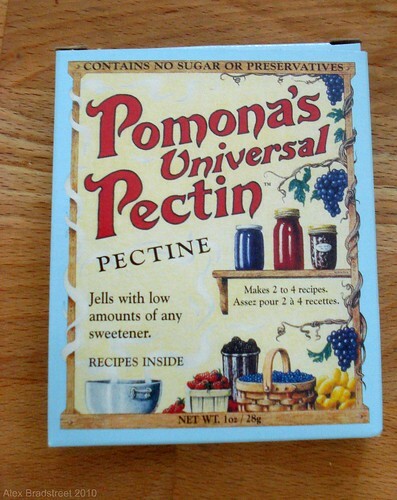 Followed Pomona's recipe to the letter, and the jam is so good! While waiting for 6 pm to roll around so I can pitch the yeast, I did some reading in my new favorite ebook, The Home Winemaking Book by some guy in the Netherlands. The basics are great, and his calculations are what I really needed to get clear on - I've calculated the amount of sugar needed to get to 12% alcohol for the blackberry and grape wines. Basically, make a syrup with water and sugar, about 1 cup of sugar in 2 cups water will work, stir until dissolved, and add to your juice. This adds about 1 lb of sugar each time, so for the blackberry I ended up with 7 lbs of sugar in my 5 gallon batch, starting gravity of 1.083. It was sweet and very fruity, so the yeast should be very happy. I took out 3 quarts of the juice-mix and stuck it in the fridge to make sure I did not have a big mess, if the yeast got too happy! I rehydrated the yeast, then added about 2 cups of the sweetened juice. As you can see, the Champagne yeast took off right away, so I added it to the big bucket and fixed the airlock - bubbles right away! 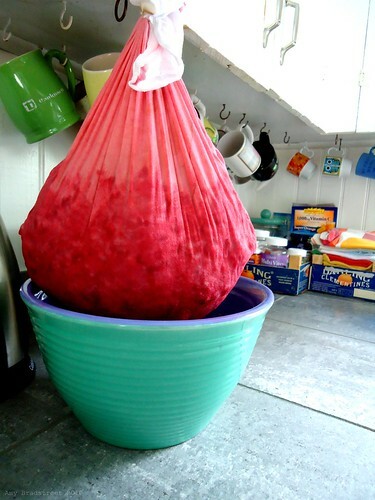 For the grape, it was about 4 lbs sugar to reach the 1.75 gallon mark. 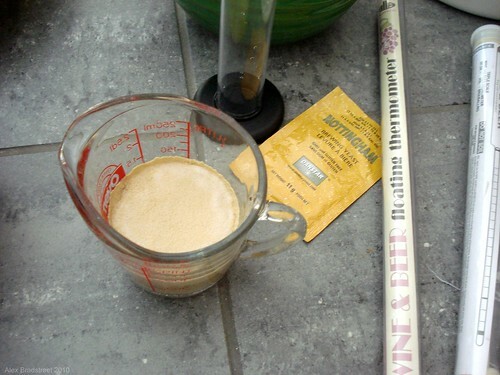 I chickened out and decided to use the RedStar Red Wine yeast, instead of my lambic starter. I rehydrated the yeast and added about 1 cup of juice. Just like the blackberry, this yeast was very happy with the temperature and the sugar levels. Since I'm using a huge container, overflow was not going to be a problem. Starting gravity 1.084. Twice per day, I sanitized my mixer, swirled around the blackberry and the grapes, and gazed in wonder at the transformation. Three days of rapid fermentation, and strong yeasty fruity smell. I added the 3 quarts back in, and the bubbles continued. On Friday, I noted the bubbling had stopped. I was planning to filter out all of the fruit, per the instructions, so I started that. After it was all filtered out, and I had just juice in the bucket, I checked the specific gravity: 0.994. Holy crap, that was easy! 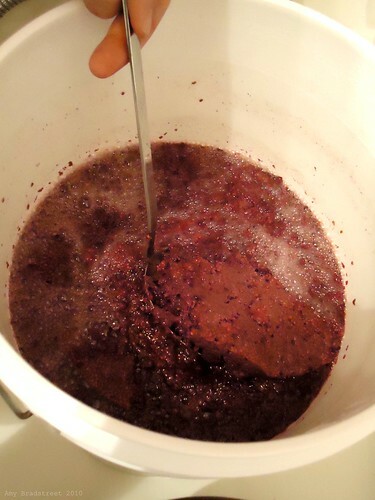 We now have about 4.5 gallons of blackberry wine, at around 12.1% alcohol. I celebrated, and then put the airlock back and let it sit. It will need to settle for a while, and then I can rack it a few times over the next several weeks (months?) to get it more and more clear. The grape and the ale have continued bubbling slowly, I'll check them both once bubbling has stopped to see if they are also done.